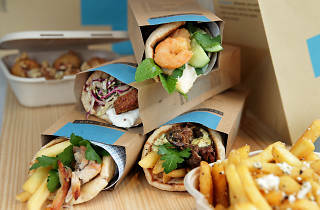 Masterchef judge George Calombaris has brought his souvlaki joint Jimmy Grants to Sydney with its first outpost in the CBD. After finding success with its flagship in Melbourne as well as his casual Greek restaurant-bar Gazi, Calombaris continues to prove he knows how to treat meat with care, even if it's a casual affair. 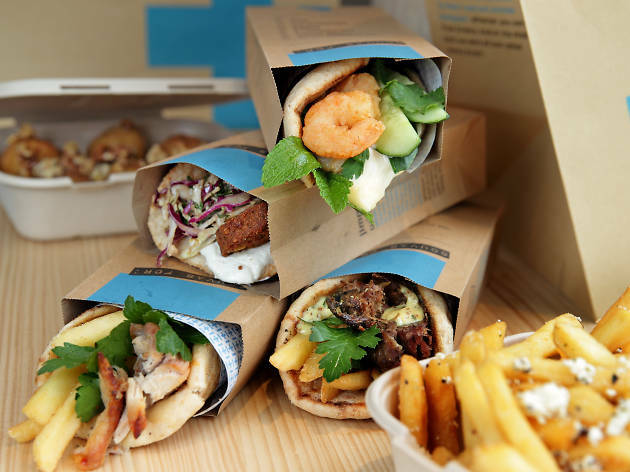 You can order your souva in two sizes – the original or almighty – and with fillings including lamb with mustard aioli, chips, onions and parsley; prawns with honey, mayo, cucumber, mint and coriander; or falafels with greek yoghurt and slaw. If you're not feeling like a wrap try a plate of chicken from the spit with tzatziki; herb and grain loaded salads or feta topped hot chippies. Drinks-wise you can order up housemade baklava creaming soda or a beer to enjoy your souva with.